Tye Sheridan stars as Wade in "Ready Player One." 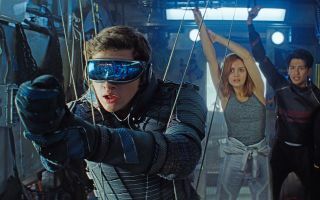 The critical and commercial success of "Ready Player One," Steven Spielberg's film adaptation of Ernest Cline's book of the same name, is a testament to effective storytelling and excellent special effects. The fictional story portrays a contest between the allure of virtual reality (VR) and the seemingly awful life on a desolate planet Earth, where people would rather spend their lives in a simulation than deal with the reality of their physical existence. But the truth is that this isn't a dystopian future but a reality we live with today: We often ignore the natural world around us because we are consumed by tech, our heads buried in our smartphones, VR goggles, computers and whatever other notifications we are receiving other than the ones coming from the real world surrounding us. The movie features a dystopian future where income inequality has prompted a mass migration of the poor to a wasteland of shipping containers made into "houses" stacked as high as skyscrapers in exoskeletons of plastic tubing and rusted scaffolding. While VR goggles and gloves are the means to escape this hell for the heavenly OASIS — an alternate universe filled with pop-culture references and "Easter eggs" from the 1980s — the message to moviegoers is simple: VR and other tech should not consume your life when life itself needs your attention. Put another way, we should encourage youths to embrace not just their tech devices but also the wonders of the natural world in addition to, and in the context of, of science fiction. We should remind them that they need only look up to see something so wondrous and free. They can see their experiments take flight, and they can watch rockets launch their own investigations to the International Space Station, where the results of their experiments can contribute to our understanding of everything from human health to the health of our planet. Virtual reality and other tech devices have roles to play in how we study and explore space. They represent interactive ways to bring a version of the heavens to Earth, and they can provide 3D, seemingly tangible representations of everything from the rings of Saturn to the dark side of the moon and even planets beyond our solar system. NASA has already started developing VR tools to train astronauts for spacewalks and "beam" scientists to Mars to plan routes for the Curiosity rover. Some of the advantages VR could bring in the future may even be too incredible to imagine today. But there are other possible ways to advance space research and exploration for future generations, and they're available right now: educational programs and tools that engage students and teachers and embolden support from the public at large. I applaud efforts by scientists and engineers to make this vision a reality. I applaud Spielberg, too, for his vision. From "Close Encounters of the Third Kind" to "E.T. the Extra-Terrestrial," his films have humanized cinematic depictions of astronomy and space as no other director has. He has inspired us to admire the beauty of the universe, not fear its boundless mysteries. He is a friend of space exploration whose films celebrate archaeologists and astronauts alike. Let us extend that spirit to the classroom, where students may remove their VR visors for a vision more breathtaking than a springtime blockbuster.